The Bambara people are among the most powerful and influential groups in Mali, though they also live in other West African countries like Guinea. They speak Bamana, which is one of the Manding languages. During the 1700s, there were two Bambara kingdoms: Segu and Karta. In the 1800s, militant Muslim groups overthrew these kingdoms, leaving only a few anti-Muslim Bambara warlords to resist their occupation. This lasted 40 years, until the arrival of the French. A very small number of the Bambara had converted to Islam by 1912. After World War II, the number of Muslim converts grew due to their resistance to the French and their exposure to Muslim merchants. Today, the Bambaras are mostly Muslim. 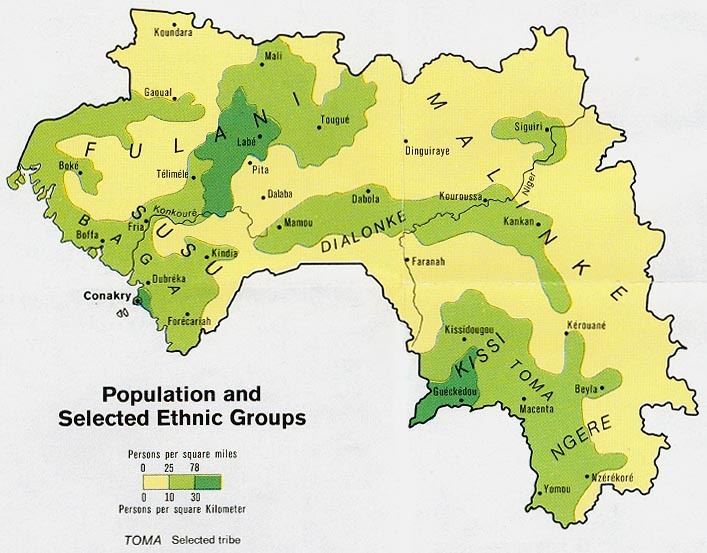 As a major people group in the region, the Bambaras live in all the countries of West Africa including Guinea. Most of the Bambara are farmers. Their staple crop is millet, although sorghum and groundnuts are produced in large quantities. Maize, tobacco, cassava, and various other vegetables are also grown in private gardens. Unfortunately, drought and other ecological problems have hurt these farmers in recent years. The Bambara farmers also raise cattle, sheep, goats, horses, and chickens. The neighboring Fulani herdsmen are often trusted to herd the Bambara livestock. This allows the Bambara to concentrate on farming during the short rainy season. Many of the Bambara hunt animals such as antelope, boar, ostrich, and guinea fowl for their meat and skins. They also gather a large amount of honey from the wild bees in the area. Both men and women share the farming duties. However, the wives usually arrive in the fields later and leave earlier than the men. This gives them time to prepare the morning and evening meals. Children between the ages of 12 and 14 also help with the family's work, leading the oxen as they plow and guarding them during rest periods. Each Bambara village is made up of many different households, usually all from one lineage or extended family. Every household, or gwa, is responsible to provide for all of its members, as well as to help them with their farming duties. Bambara homes are typically larger than the homes of most other West African groups. Some of the houses contain as many as 60 or more family members. The members of each gwa work together every day except for Mondays. Monday is market day and the traditional day of rest. Islamic schools have been set up in some of the Bambara villages. However, many of the non-Muslim villages have failed to establish schools simply because the children are needed to stay home and help with the farming. For this reason, some village populations are entirely illiterate. Marriage is very important to the Bambara people. Although the cost of a wedding is high, it is viewed as a type of "investment." The main purpose for marriage is to have children, which provide the family's labor force and ensure the future of the family lineage. The average Bambara woman has eight children. Even elderly widows in their 70s or 80s have suitors because the Bambara believe that a wife increases a man's prestige. Although most Bambara claim to be Muslim, many still follow their traditional beliefs such as ancestor worship (praying to deceased ancestors for guidance). The Bambara believe that the ancestral spirits may take on the forms of animals or even vegetables. In special ceremonies, the spirits are worshipped and presented with offerings of flour and water. The eldest member of a lineage acts as the "mediator" between the living and the dead. Several mission agencies are currently focusing on the Bambaras, and some progress has been made. Prayer is the key to tearing down the remaining strongholds that are keeping them from knowing the truth. * Scripture Prayers for the Bambara in Guinea. * Pray that the Holy Spirit will reveal to Bambara elders and leaders the supremacy of Christ. * Pray that the Bambara people will put aside anything that gets in the way of finding true spiritual nourishment, and seek Him. * Pray for a Disciple-Making movement to spread throughout Bambara communities.